Just Call Me Chaviva: Time to Craft Your Shlissel Challah! A Beautiful Shlissel Challah by Mandy D.
I love sharing little-known customs in Judaism, even those that I don't necessarily practice myself. I'll admit that if Mr. T were around I'd probably bake up a delicious, beautiful shlissel challah this Shabbat, but since it's just the little one and I and it's snowing in Denver, chances are I'll use my molds for some easy gluten-free challah. Just what is shlissel challah? 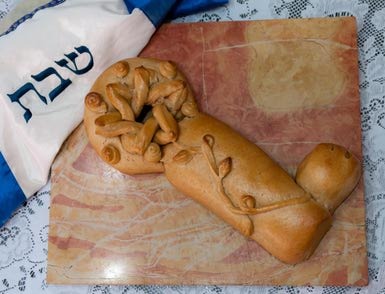 For the first Shabbat after Passover, it's common in some circles to bake a challah either in the shape of a key or with an actual key baked inside -- shissel being Yiddish for "key." The custom is considered a good omen for livelihood, or parnassa! I've got a whole article on it over on About.com's Judaism page. Check out the origins, possible ties to Christianity, and recipes, too. Take me to the shlissel challah!